Herbert Achternbusch (born 23 November 1938 in Munich) is a German writer, painter and filmmaker. His anarchist surrealistic films are not known to a wide audience in Germany, although one of them, Das Gespenst (The Ghost), caused a scandal in 1983 because of its alleged blasphemous content. Werner Herzog, a director of the New German Cinema, based his film Heart of Glass on a story by Achternbusch. In 1981, he directed the film Der Neger Erwin, which was entered into the 31st Berlin International Film Festival. The following year, he directed The Ghost, which was entered into the 33rd Berlin International Film Festival. In 1988, his film Wohin? was entered into the 38th Berlin International Film Festival. In 1995, his film Hades was entered into the 45th Berlin International Film Festival. 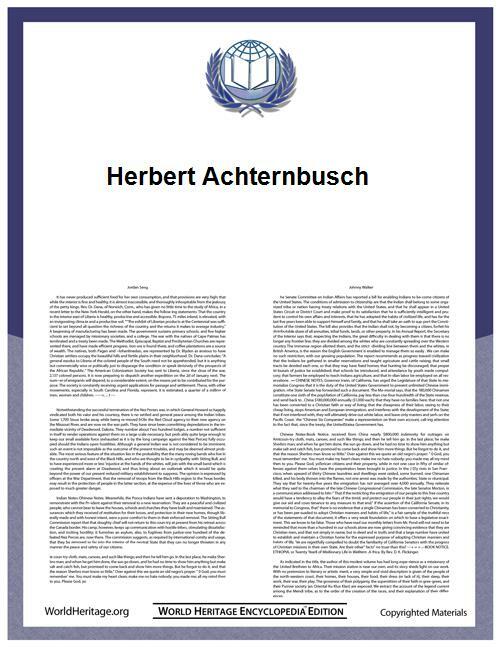 Herbert Achternbusch was awarded the German international literary Petrarca-Preis in 1977, but he declined. In 2010, he was awarded the Kassel Literary Prize. He won the Mülheimer Dramatikerpreis in 1986 and 1994. Hans-Michael Bock (rd. ): The Concise CineGraph. Encyclopedia of German Cinema. New York, Oxford: Berghahn Books 2009, p. 2-3.